Tissue, cells or virus corresponding to CD58. ALM-6 human pre-B cell line. Flow Cyt: Human peripheral blood cells. The purified antibody is conjugated with Fluorescein isothiocyanate (FITC) under optimum conditions. The reagent is free of unconjugated FITC. The purified antibody is conjugated with Fluorescein isothiocyanate (FITC) under optimum conditions. The reagent is free of unconjugated FITC and adjusted for direct use. Our Abpromise guarantee covers the use of ab26006 in the following tested applications. Ligand of the T-lymphocyte CD2 glycoprotein. This interaction is important in mediating thymocyte interactions with thymic epithelial cells, antigen-independent and -dependent interactions of T-lymphocytes with target cells and antigen-presenting cells and the T-lymphocyte rosetting with erythrocytes. In addition, the LFA-3/CD2 interaction may prime response by both the CD2+ and LFA-3+ cells. 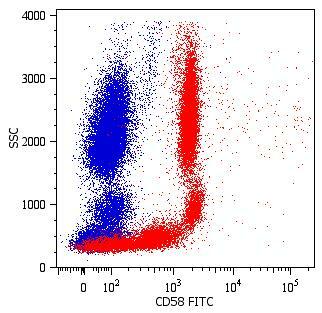 Flow Cytometric analysis of human peripheral blood cells labeling CD58 with ab26006. Surface staining. ab26006 has not yet been referenced specifically in any publications. Publishing research using ab26006? Please let us know so that we can cite the reference in this datasheet. I am interested in 2 products that both have "100 tests" listed as the size. I'd like to know what the mass or concentration is for each product. The concentration of our current lot of ab21845 is 30 ug/ml. We are currently out of stock of ab26006 but the concentration for that product will be 45 ug/ml.